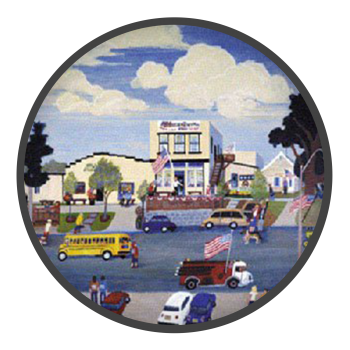 According to the local oral history, the Houchen family owned the pharmacy in Utica. During the depression years, Ervin Houchen attended the University of Nebraska to train in pharmacy, but decided not to pursue that as a career. Upon returning to town, he began working with the local book repair person. Back then, towns often had a cobbler, blacksmith, auto and tire repair, and a book repair operation. From that beginning Ervin continued to grow the operation and by the late 1960’s, had taken Houchen Bindery Inc. to very respectable levels of size and service area. As he transitioned into retirement the business floundered some, and in 1977 the business was sold to H Don and Connie Osborne of Omaha. Don had previously worked in the dairy industry, but had tired of its difficulties and wanted to try something new. He recruited his entire family in the early years to pitch in and place Houchen Bindery Ltd. on a growth path. Indeed he succeeded, and over the next 38 years, Houchen Bindery Ltd has seen steady growth. Along the way, it has purchased in part in whole the binding operations of 14 different companies. Re-investing in newer equipment and processes has kept the company well positioned for continual growth. The family has always recognized being part of trade associations, either as an exhibitor or a member, is vital to keeping current. Attendance at our bindery trade associations, particularly Library Binding Institute, was critical to that growth path. Because of these meetings, our personnel have toured dozens of library and edition binderies, numerous printing facilities, as well as visited paper, buckram, board, adhesive, endsheet and equipment manufacturers in the United States and Canada. Once per year attendance at ALA is common, as are our over 20 per year appearances at state and special library meetings. We have also attended meetings about on-demand publishing, historical preservation, press associations, GraphExpo, BIA, BMI, DRUPA, PMA and other related events, including Comic-Con.